The University of the East Red Warriors have had their dark years. Seeing the University of Santo Tomas Tiger Fencers and even the University of the Philippines Fighting Maroons hoisting that golden trophy in their stead was not a sight pleasant to the likes of Eric Brando and Fritz Gutierrez. Nathaniel Perez, Michael Nicanor, CJ Concepcion, and Sammuel Tranquilan then made sure it would not happen again for the next seven years. 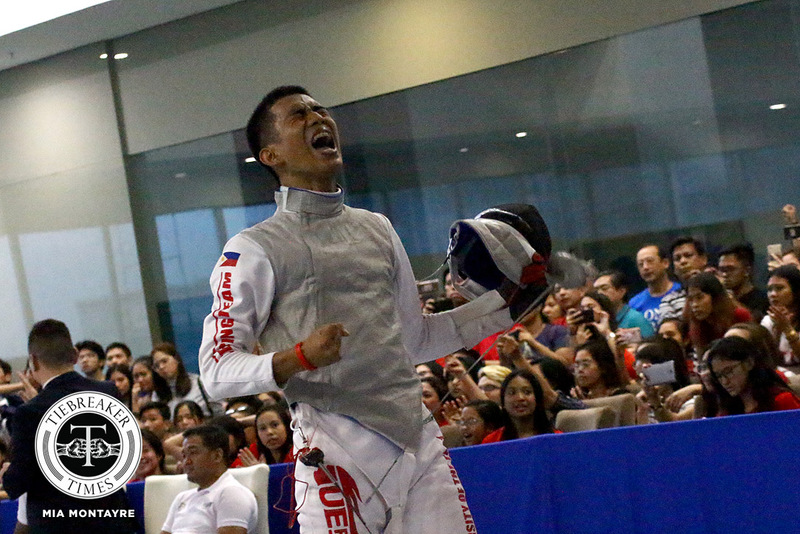 This time around, the Red Warriors started and ended the current UAAP season with golds to seal UE’s first championship of the season and 11th overall in men’s fencing, Sunday at the Victoria Sports Complex in Quezon City. UE virtually had their seventh straight crown in the bag due to the two silvers Tranquilan and Jancel Concepcion bagged in individual sabre and foil events, even as a single school would sweep the weekend’s three team events. Nonetheless, the Red Warriors would never settle. However, come Saturday, the Red Warriors only came up with a split of day’s assignments. In the morning’s team sabre finals, UE had to fend off a determined UP squad led by rookie and Far Eastern University Diliman alum John Paul Dayro. The Fighting Maroon extended the lead to 25-21 before CJ Concepcion turned it around in the following bout to 30-26 over Ryu Senora. The Red Warriors eventually moved to two golds away from a golden sweep, 45-37 was the final score. De La Salle University had other plans and ultimately snapped that “greater dream” of a golden sweep later that afternoon. Leaning on the skills of eventual Rookie of the Year Daryll Lumahan, the Green Fencers stopped the UE quartet in the epee team finals. La Salle third-man Hadj Satinitigan stood his ground against Tranquilan and kept his team at 25-19, leading to a 45-34 win as Lumahan scored 10 in the final bout. The sweep might have been quashed, but the seven-peat champions would not be denied of ending the season in dominant fashion. In the next day’s afternoon foil finals, Tranquilan redeemed himself in his main weapon. Dealing with rookie Jolo Viceo and a precarious three-point advantage in the last bout, the eventual Most Valuable Player tried to deny the attacks from the Atenean. Viceo kept himself and his squad in the fight, but a sorry red card and its consequent point to the opponent was not the ending to his first UAAP season the freshman wanted. On the other hand, however, it was just the cherry on top of the icing Tranquilan had to a back-to-back MVP plum. For senior and former captain CJ Concepcion, however, and Tranquilan would agree, the seven-peat has always been a collective effort from the team given it was a small but tightly knit one. When the dust has settled and with their seventh straight title in the bag, expect the Red Warriors to not only do quadruple time but octuple time if possible for an eight-peat championship. In order to do that, the team needed to deal with pressure. “Pag napre-pressure kamin, ine-enjoy na lang namin ‘yung laro. We enjoy the game and we fight not just for ourselves but for our pride.